Matrix Cycles began life back in 1997 when its founder decided to get into the frame manufacturing business and ended up selling 500 in a single year. While the designs were initially outsourced to other companies in order to be manufactured, the company eventually got its own factory and has gone from strength to strength. Frames are still its primary focus, but its range of products includes a number of other cycle components and it has been busy expanding its business into Europe after finding success in Asia. Matrix Cycles produces frames for road bikes, triathlon and time-trial bikes and mountain bikes, so you can pick and choose the components you need to build your own bike or even create an entire bike online based around the frame of your choice. In terms of road frames the F22 frameset is the most affordable of the bunch. It is designed to combine a focus on durability with ergonomic concerns so that the rider can remain comfortable while they power their way to victory. Lateral stiffness is another key asset of this frameset, because Matrix Cycles wants the rider to be able to transfer power through the pedals as efficiently as possible. The Rafael Pyro and Apache Pyro are the two increasingly advanced framesets offered in the road bike category. The Apache is the cream of the crop and has managed to become the frame of choice for many professional riders. As well as being stiff and light thanks to its carbon fibre construction it also benefits from having a one-off design for the seatpost which allows increased riding fluidity and comfort. The Tank range of frames are designed for mountain bikes and even the Race Elite model, which is the most affordable, will be lighter and stronger than other alloy competitors in the same price bracket. Meanwhile the Tank Ruby Full Carbon frameset has been endowed with Matrix Cycles’ typical care and attention when it comes to frame geometry. Rigidity and stiffness are not always guaranteed when you have front-end suspension, but here the firm’s reputation for efficiency is upheld. 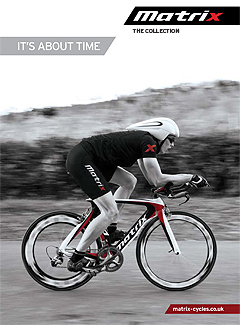 Triathlon frames from Matrix Cycles are advanced and highly competitive. The Pyro TT frameset is brand new for 2012 and has the kind of angular tube design which will minimise drag and the impact of side winds. The F18 is adaptable to work with both disc brakes and standard calliper braking systems, so you can pick the setup which best suits your requirements. Aside from frames you can also invest in Matrix Cycles saddles, handlebars, stems and even an all-carbon bottle cage. These are all light weight and the emphasis is definitely on providing the rider with as much carbon as possible in order to reduce the weight of their bike. Road, triathlon and mountain bike wheels can also be found in the Matrix Cycles catalogue of products, which in short allows you to build a bike almost entirely using components from this single manufacturer if you are a big fan of its items.